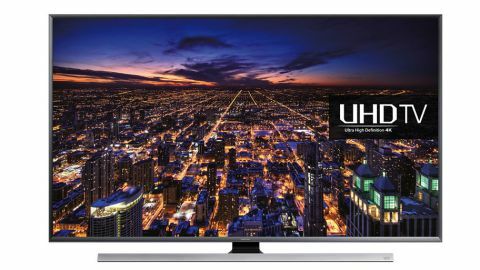 An excellent, if slightly small, UHD TV with an impressive set of specifications. You'll have to get your hands dirty in the system settings to nail a quality image, though. The two 2015-generation Samsung TVs we've seen prior to today have both blown us away with their amazing high dynamic range-powered picture quality. Unfortunately, though, their unprecedented talents have come with eye-watering price tags attached. Which is why many of you – and your bank managers – will be very pleased about the arrival of the Samsung UE48JU7000T. For while this 48-inch TV might not have quite all the bangs and whistles of Samsung's £6,000 UE65JS9500 and £4,000 UE65JS9000 sets, it does still offer a very impressive feature list, built around a native UHD 4K resolution, for the considerably less painful price of £1,400. That native UHD resolution finds it sporting 3840x2160 pixels rather than the 1920x1080 of full-HD TVs, delivering four times as much resolution. Some will question the usefulness of so many pixels on a screen that's only 48 inches across, arguing that you can't appreciate all those pixels on a relatively small screen. I've seen enough evidence from my TV tests, though, to refute this. For while it is true that bigger screens make the UHD difference more obvious, it's still apparent at the 48-inch size, especially in the picture's enhanced depth and colour definition. Backing up the UE48JU7000T's UHD resolution is Samsung's PurColor technology, which uses powerful processing to produce a wider range of colours than typical LCD TVs. To be clear on this point, the UE48JU7000T does not use any 'physical' colour enhancement technologies, such as the Nano Crystal system sported by Samsung's JS9500 and JS9000 TVs. So you won't get the HDR-driven colour spectacle that works so gorgeously on those higher-end TVs. But them's the breaks when you're spending so much less money on your TV, I guess. Also catching my eye is the UE48JU7000T's backlighting system. For rather than the edge LED lighting engine I would have expected on a £1,400 UHD TV, it sports direct backlighting, where the LEDs are positioned directly behind the screen. This makes it easier for screens to control their lighting to boost contrast – especially when, as in the UE48JU7000T's case, the LEDs benefit from local dimming, where different areas of the LEDs can be controlled separately. In other words, the UE48JU7000T should be able to deliver deeper black levels in dark areas without having to compromise the brightness of the light areas – something edge LED systems find notoriously hard to do. Even if they use local dimming. The PurColor, local dimming and 4K upscaling processing the UE48JU7000T provides are all driven by a quad-core chipset, which additionally handles the new Tizen-powered smart TV system Samsung has introduced to its TVs this year. This smart system feels like a work in progress in some areas – for instance, it's still waiting for Samsung's Recommendations engine to be added, and can occasionally respond sluggishly to your commands. Nonetheless, overall it's a big step in the right direction for Samsung, replacing the rather cumbersome full-screen, confusingly organised menus of 2014 with overlaid menus that focus much more tightly on highlighting the content you most want to watch – such as the most recent AV inputs or TV channels. BBC iPlayer, ITV Player, 4OD, Demand 5, Netflix and Amazon Instant are all onboard – and the latter two support UHD streaming, so long as you've got the necessary 15Mbps or so minimum broadband speed. As I'd expect of any relatively high-end Samsung TV, the UE48JU7000T carries 3D support. This is, as always with Samsung, of the Active variety, which in this instance requires the TV to upscale 3D Blu-rays to UHD to deliver a full-resolution image to each eye. I couldn't help but be struck by how the UE48JU7000T doesn't ship with any 3D glasses included as standard. Samsung has previously been one of the most generous manufacturers when it comes to including 3D glasses, so you have to wonder about the format's future if even Samsung is no longer enabling 3D viewing right out of the box on one of its poshest TVs. I've so far cunningly managed to avoid mentioning the UE48JU7000T's design; so let's put that right now, starting with the fact that it's flat, ditching the curved screen employed on the JS9500 and JS9000 series. Whether this is good or bad news is a matter of personal taste – though if you're not sure of the pros and cons you can check out our in-depth reviews of the two top Samsung screens. The frame around the screen features the same angular, chamfered look as the Samsung JS9500 range, though since this is clad in dark grey rather than bright silver in the UE48JU7000T's case, the appeal of that chamfering is somewhat reduced. The biggest aesthetic impact in the UE48JU7000T's design comes from its stand, which protrudes forward from the screen and features a raised silver front adorned with the letters 'UHD'. Cable haters might like the UE48JU7000T's use of an external Mini One Connect box, too, which houses all the HDMIs so that you have only to connect your sources to the TV via a single connection. Though unlike the full-sized One Connects you get with the S9500 and JS9000 Samsung TVs, the Mini One Connect doesn't house the tuner ports or TV processing brains, both of which are found instead on the main TV chassis. This means that you can't simply upgrade your UE48JU7000T by adding a future new One Connect box, as you can with the higher-end Samsung models.